While writing and publishing posts on a day-to-day basis can cause you to fall behind your competitors and feel rushed, an automated queue can remove the need for you to schedule a different publishing time for each post. Once you are in your Queue (pictured above) you are able to see all of the posts that you have previously scheduled out. Scroll through the individual days to see any posts that you have in your queue for that day. If you are seeing a post that you think would be effective to go live on a different date and time, you can simply drag and drop any post to your desired time. You can also have more slots in your Queue when you navigate to your settings. Once you are in your profiles and queue settings you can add another profile, as well as edit existing one. 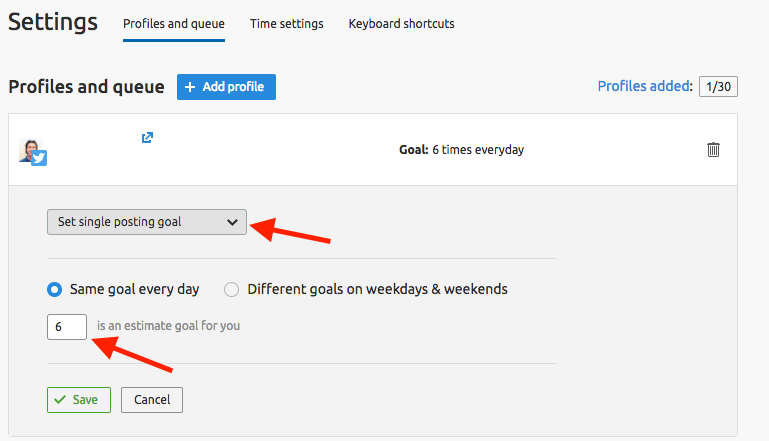 To create more slots, click on the set single posting goal in the dropdown menu and enter how many posts you want each day. After building up your queue, you are going to want to view your published posts in the "Posts" tab of the tool.